Ya’ll know I’m no stranger to a little potty talk (see here and here), so let’s get another issue out there. This one is pretty crunchy (much like the DivaCup), but after the initial ‘c’mon, this is crazy talk!’ and a little help from Emma’s stool, I think it’s legit. I first saw the ad in my Paleo Magazine and dismissed it instantly. I know what you’re thinking, what the….? I thought that, too, but decided to look deeper into it. 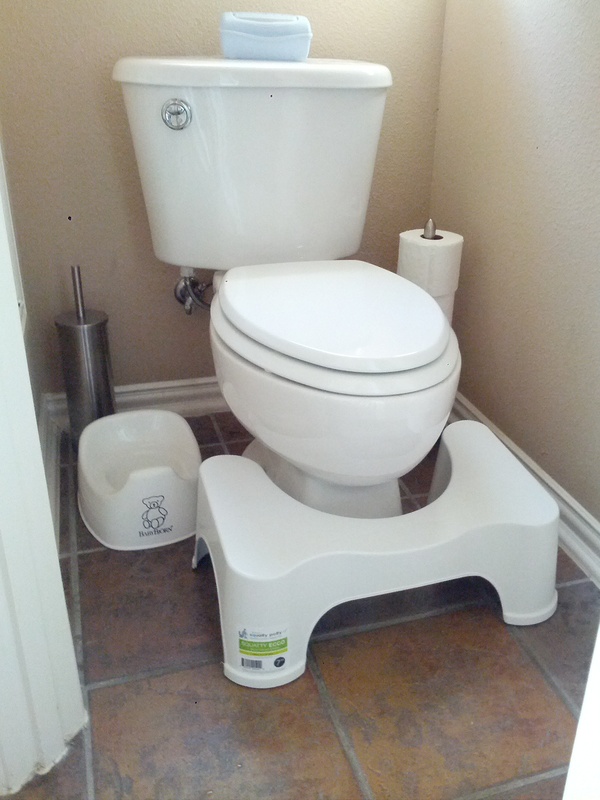 Basically, the Squatty Potty is meant to mimic the way we used to go to the restroom/sit/etc. 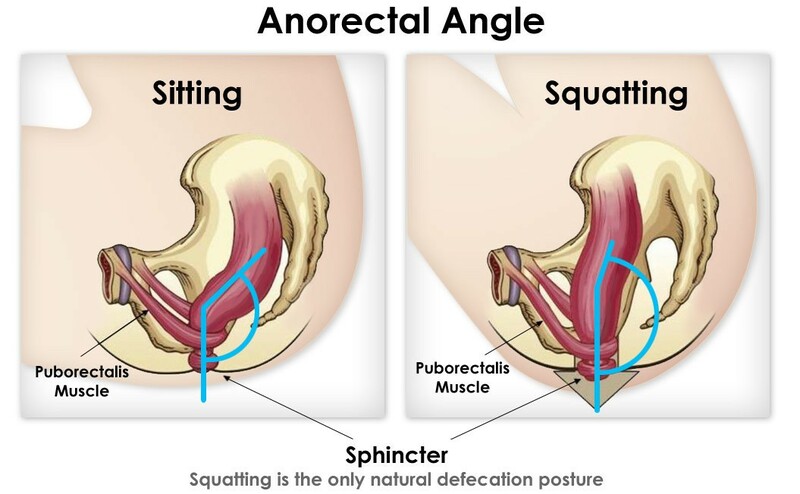 Man only knew how to squat way back then, and it sounds like there are several cultures that still do, so apparently we’re doing something wrong. Leave it to us to have all these luxuries of going to the bathroom on a porcelain god rather than a simple hole in the ground. Even Emma’s swim teacher told us how they went on a mission trip to China and was sternly shown the proper way to face when squatting to use the restroom…talk about a humbling moment. The basic thought process is that since the development of the toilets, people now sit at a 90° angle (partially relaxed colon) to go poop. The Squatty Potty allows you a 35° angle squat, and a fully relaxed colon, while on the comfort of your conventional toilet. I know what you’re saying, this is ‘crap’ and makes no sense, but I have to disagree! Emma has been going on the potty for some time now, so I bought her one of those Baby Björn step stools to help give her access to the toilet early on. Well, little did I know when using her bathroom that a version of the Squatty Potty was literally under my feet. Granted the standard Squatty Potty is 7″ or 9″ tall (depending on toilet heights) and Emma’s stool is 6″, BUT her stool definitely did help. Honestly, when I go #2, I make it a point to use her toilet so I can get the benefit of her stool. UPDATE: I ordered a 7-inch stool and really can tell a difference! I never would have thought that some contraption could help the ease of going #2, but it has. Even Emma thinks she needs her stool every time she goes potty even though she can’t even reach the darn thing. Maybe it’s not a bad idea to start ’em young. I promise it’s not that crazy and could actually help you if you have issues when settin’ on the pot. Just do me a favor and watch the video. Think about it and if you happen have to have a kid’s step stool (between 5″ & 9″ high) lying around, give it a shot. It looks like they have a cheaper stool that won’t break the bank, starting from $24.99, but they can go all the way up to $59.99 during their sale. You may not want to invest in the actual Squatty Potty, but I am considering it…would make for a great conversation piece when people are visiting. Ha. Now, if I could only find a portable version that I could take with me, so I don’t have to squat on a toilet but still have the ease of a stool/Squatty Potty that would be ideal. I’m totally kidding. Kind of. Note: I wasn’t paid or perked for any of these products. the instant you get pregnant, some one should tell you about this. I haven’t met a preggo that couldn’t use help in this department.